Speereo Voice Mailer freeware for smartphone, Windows mobile phone free downloads. � Summary: Speereo Voice Mailer is a perfect solution to manage your e-mail accounts. With intuitive one-button speech interface any operations with mail take seconds. Send, delete and sort your letters with simple voice commands. 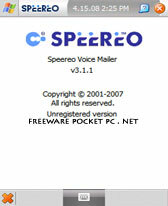 Speereo Voice Mailer for WM devices is a freeware voice operated program with unique function of creating audio e-mail message. It features all basic operations with e-mail messages and sorting by various parameters. From now on you will forget about SMS language for your e-mails. You can go with T9... or your message can be recorded at the speed of your voice! Enjoy your newly obtained free time by avoiding the mess with small keyboard � just talk! Speereo Voice Mailer is designed for frequent e-mail users who wish to expand the capabilities of their devices by trading up standard Graphic User Interface to the comfortable Voice Interface. In the program original e-mail functions are voice enabled. Speech commands are especially helpful for smartphone owners due to limited screen size and resolution of such devices. The program is fully compatible with Microsoft Outlook, both Pocket and Desktop. Speereo Voice Mailer syncs with PC by simple and reliable means of connection. The program works with all the contacts and letters the user already has, which allows to bypass converting data or re-entering it. Speereo Voice Mailer is based on the proprietary speech interface of award winning Speereo Voice Organizer. Attached voice file is being recorded and delivered in a small file thanks to the advanced voice compression algorithm. It guarantees the absence of any possible memory shortages typical for other speech interfaces. With Voice Mailer there is no need to dial out, save files to server or pay for subscription. The program is absolutely free! It is compatible with all Windows Mobile devices. How do we do it? I used the Mobile Friendly link ...found the download button....and download straight to my cell phone. Afterwards, I found 5 or 6 files with wording like MPIX but none are executible on click and I COULD NOT figure out how to install!! !